You've probably heard of Scholastic's Kids Are Authors contest. For thirty years, teams of students from elementary school classrooms across the United States have written and illustrated their own books and submitted them to the competition in hopes of winning and getting their entries published. Teachers have used it as an opportunity to teach students about setting goals, doing research, plotting stories and creating with words and art. And because each entry has to be created by teams of at least three students, it's a valuable exercise in collaboration. 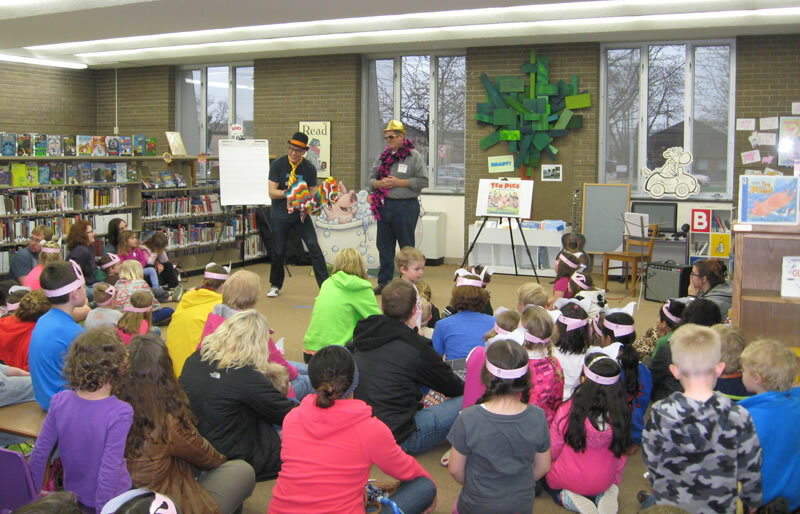 The Kids Are Authors contest has received thousands of submissions each year. The entries go through rounds of judging by professionals from all walks of life including teachers, journalists, graphic designers, etc. When the finalists are selected, those submissions are sent to a small group of children's book authors. We carefully review each entry, rating them on a series of very specific criteria. We send our reviews back to the folks at Scholastic who then select the winners. 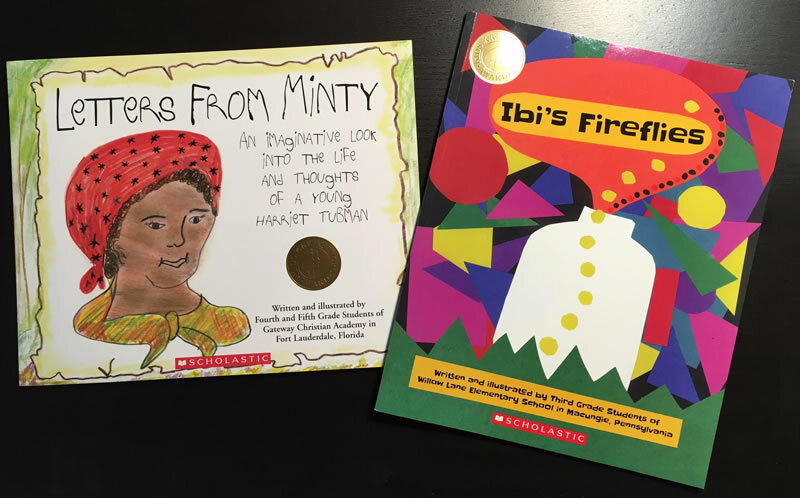 A Grand-Prize winner is chosen in both fiction and non-fiction categories and both are published by Scholastic Book Fairs. This was my second time judging, and I enjoyed it just as much this time as I did the first time. Congratulations to the fourth and fifth grade students at Gateway Christian Academy in Fort Lauderdale, Florida who won in the fiction category. And to the third grade students at Willow Lane Elementary School in Macungie, Pennsylvania who won in the non-fiction category. Your books are terrific. And congratulations to all those who created books and submitted them. The first step toward any dream begins with exactly that- taking a step. It doesn't matter if you didn't win. If you enjoyed creating your book, keep creating. Keep writing stories and drawing pictures. 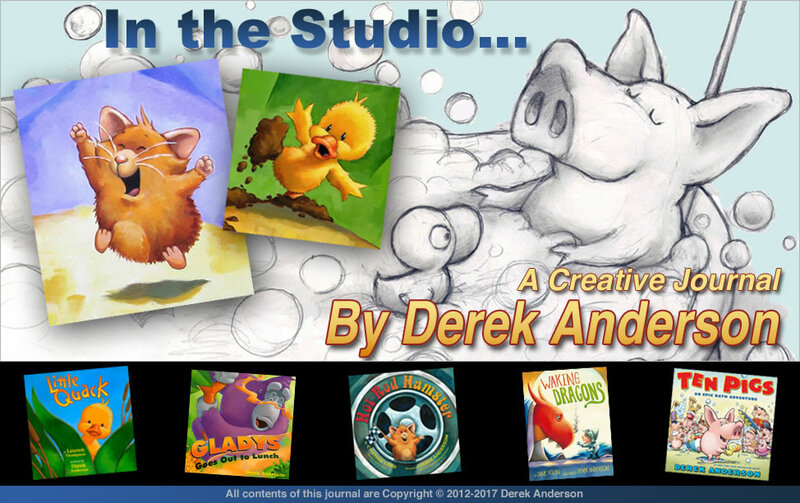 I wasn’t published the first time I sent a story or painting off to a publisher, either. It takes most authors and illustrators years of being rejected before we're finally given a chance to make a book. If you don't give up, anything is possible in this world. Though they've decided to discontinue the Kids Are Authors competition, this was never just a contest. 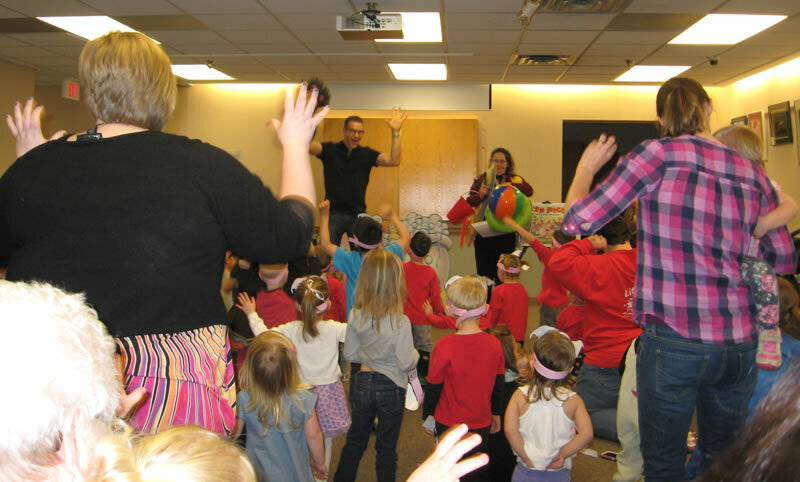 It was an endeavor to teach kids about creating and to see what they would come up with. Just because the competition is coming to a close doesn't mean classes can't continue to create books for their own schools. I hope they do. I hope teachers challenge their classes to create something so great, they surprise even themselves. Many thanks to Robin Hoffman at Scholastic Book Fairs and Sandy Blanchette, Scholastic's Kids Are Authors program manager, for asking me to participate as a judge again this year. To see a list of Grand-Prize winners from past years, click HERE. in the Twin Cities this week! Both shows are free and open to the public. For further details about the libraries including maps and phone numbers, please go to the Once Upon a Reader calendar page and click on the name of the library HERE. out of bed and looked up at the moon. More FUN from the Ten Pigs Trunk Shows! I've gotten a bit behind posting pictures from this Once Upon a Reader Trunk Show tour. When I'm not on the road doing shows, I have to catch up on my book deadlines here in the studio. 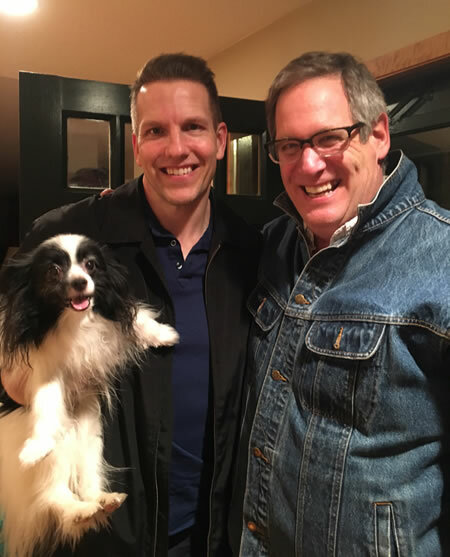 Back in April, I hit the road with my friend, musician Tom Lieberman. 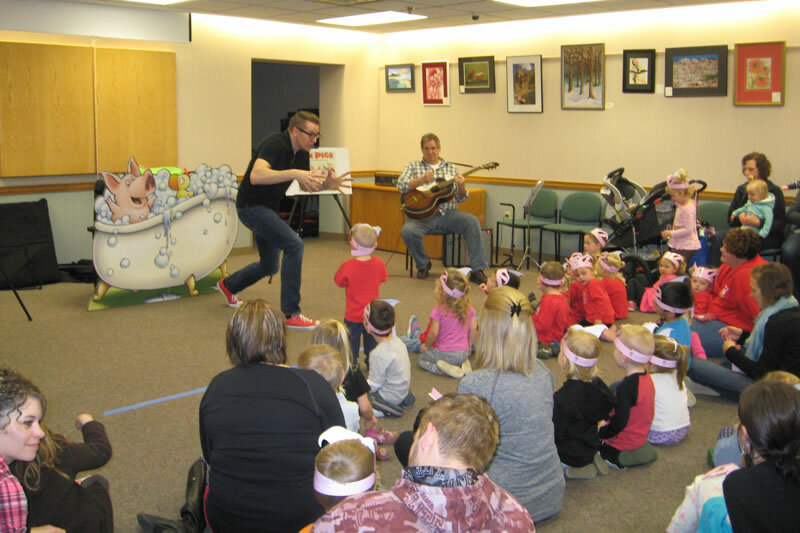 We traveled to the Viking Library System in central Minnesota where we performed in Wheaton, Morris, Alexandria, Fergus Falls, Glenwood and Elbow Lake. Tom is so talented! Besides his long stint as a performer and writer on A Prairie Home Companion, he's a founding member of the local band Rio Nido, he was a producer on the movie Sweetland, and performs on local stages around the Twin Cities as a puppeteer with Luke the Uke, a talking ukelele. And if that isn't enough, Tom also wrote and recorded an original song for our Ten Pigs Trunk Show! Tom also acted with me in many of the shows. There's some fun acting in the middle part of the Ten Pigs Trunk Shows. If you see me throwing on a hat and tie, there's going to be a show! 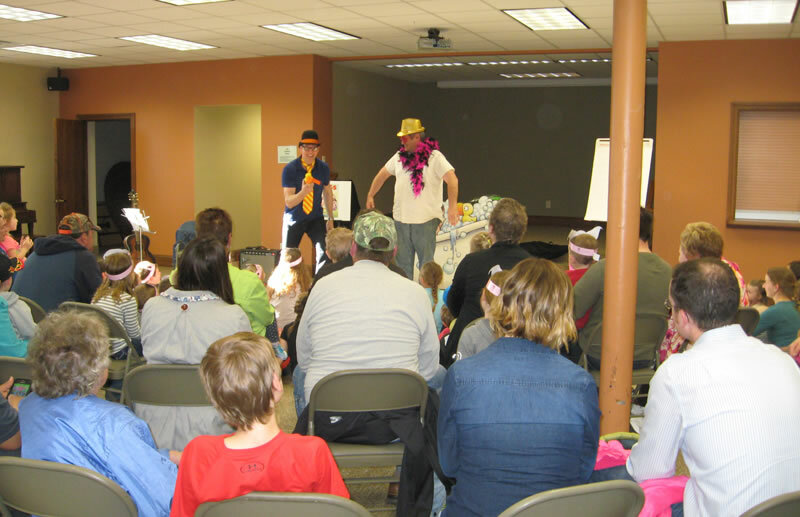 We headed off to Morris, MN in the afternoon where a nice crowd gathered for our evening show. Tom really knows how to make a feather boa look good. There are always books to sign after the show. 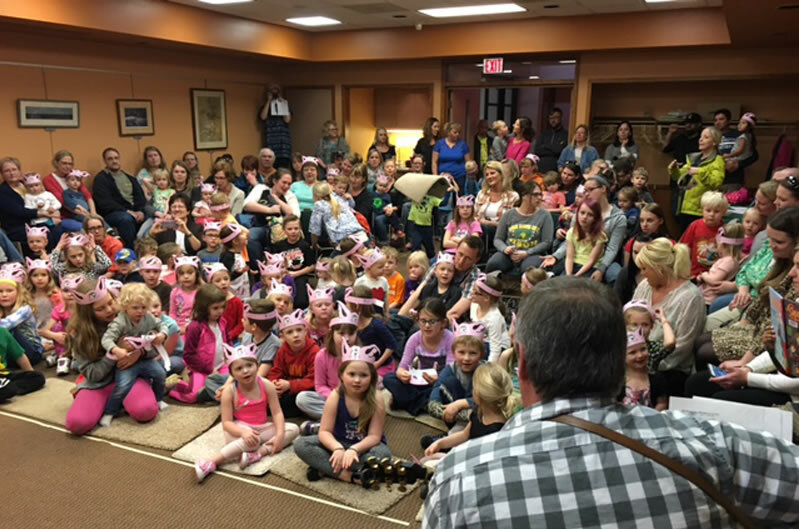 One of my favorite parts of doing these performances is meeting the young readers, their parents and grandparents after the show. Here's the fabulous Gail Nordstrom, who's the Public Library Consultant for the Viking Library System. Gail attended every show there. 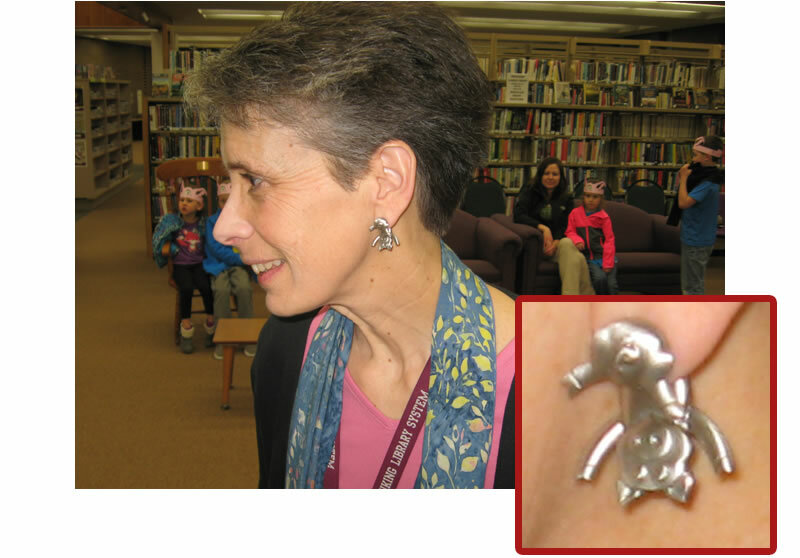 She takes her job very seriously- she even wore pig earrings in honor of my book Ten Pigs: An Epic Bath Adventure. Now that's commitment! 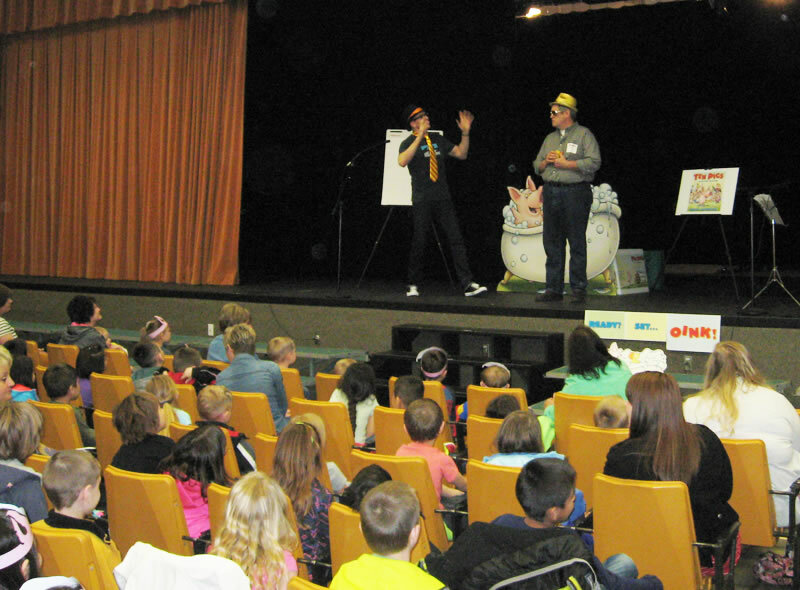 The next morning, Tom and I performed for a lively crowd in Alexandria, Minnesota. 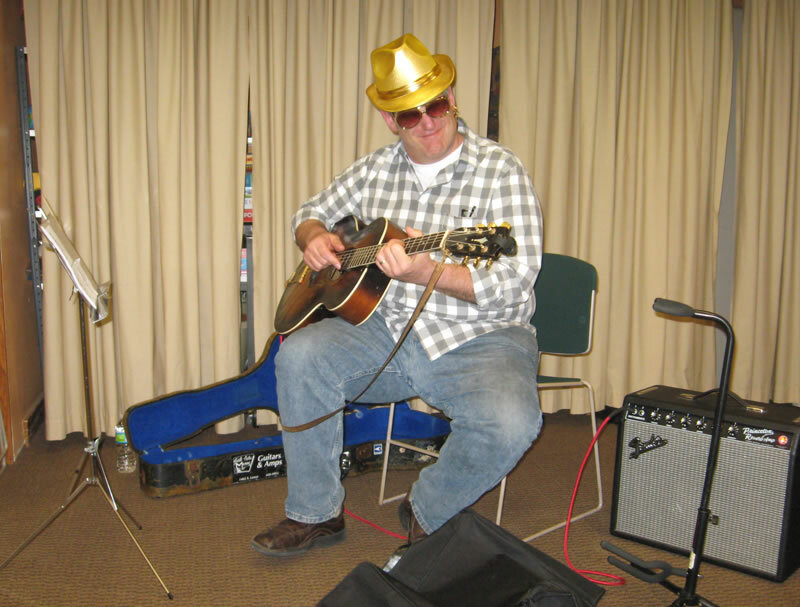 It was interesting because Tom began to play some background music during the performance and as the week went on, he began to make sound effects on his guitar that perfectly underscored the things I was acting out for the audience. The live song was a favorite part of every show on this leg of the tour. It's super special to have the artist there performing it in person. 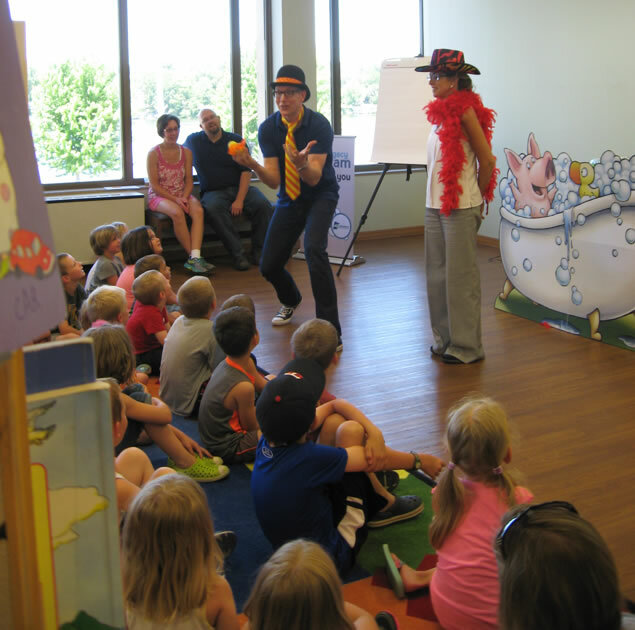 Here, librarian Kristin Woizeschke desperately tries to hold all the props the pigs bring into the tub in the book while the audience moves to the music. 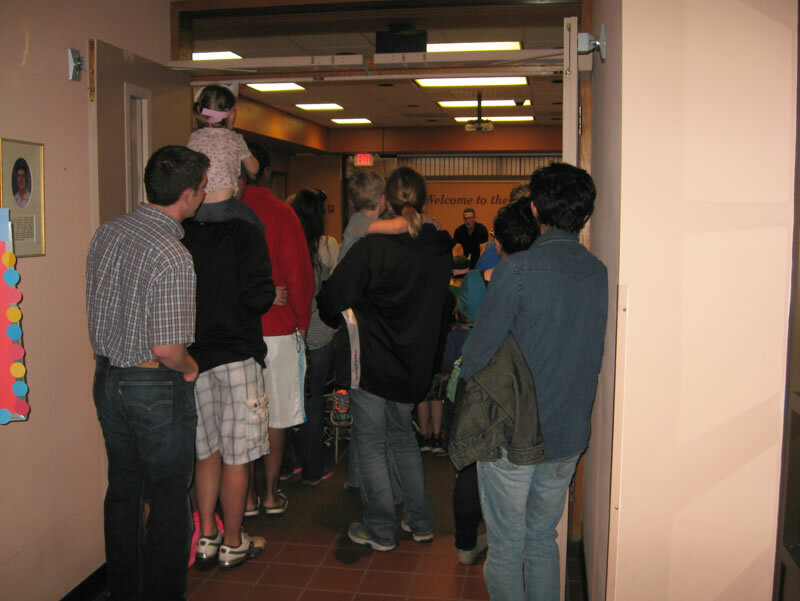 We had an absolutely packed house in Fergus Falls that night. I snapped a couple pictures while Tom was warming up the crowd and families were still streaming in and finding seats. 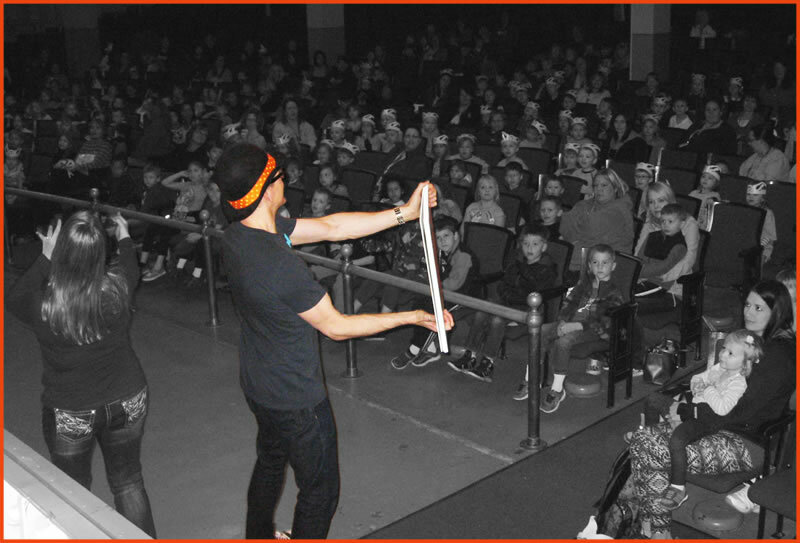 By the time we began the show, it was standing room only in the back. Fergus Falls is an amazing community! Tom Lieberman channeling his inner rock star! One of the best parts of doing these Ten Pigs Trunk Shows around the state of Minnesota (besides getting to meet so many terrific librarians and readers) is getting to see all of these amazing cities around the state. I'm not a native Minnesotan, I grew up in the great state of Iowa. And though my wife and I have lived in the Twin Cities for more than twenty years, I've never traveled the state the way I have this year. Glenwood is one of those beautiful areas that I can't believe I've never visited before. Seated on the Northeastern shore of Lake Minnewaska, it's such a unique area with beautiful rolling hills. The bathtub has been very popular at the shows and a lot of kids want their pictures taken with it afterward. Here, we got a few props out for the kids to hold while we took pictures. These shows simply wouldn't be a success without all the librarians in each and every city. 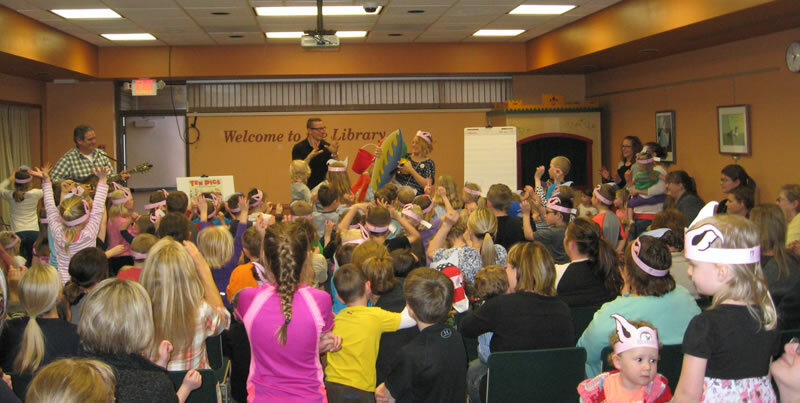 They get our young readers and fans of books excited about stories. 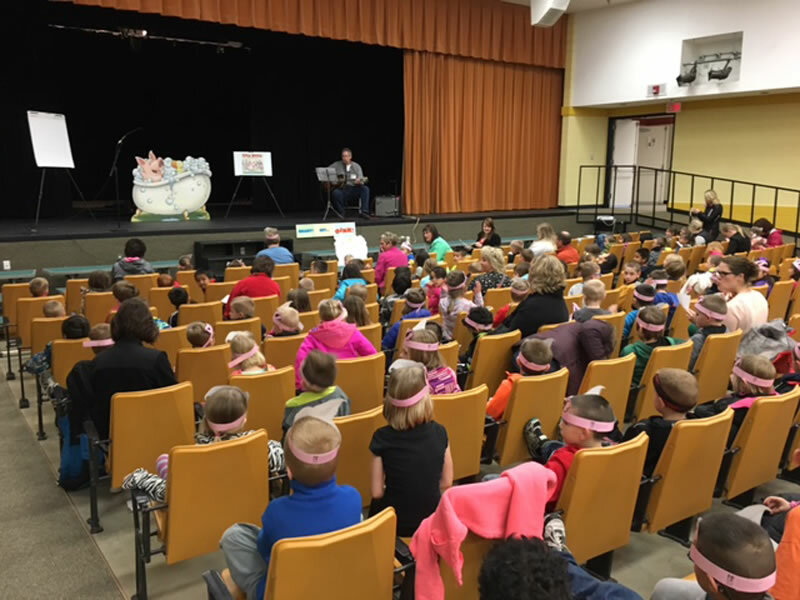 They're tireless advocates for reading and literacy and their efforts are absolutely evident when we go into these communities to perform the shows. 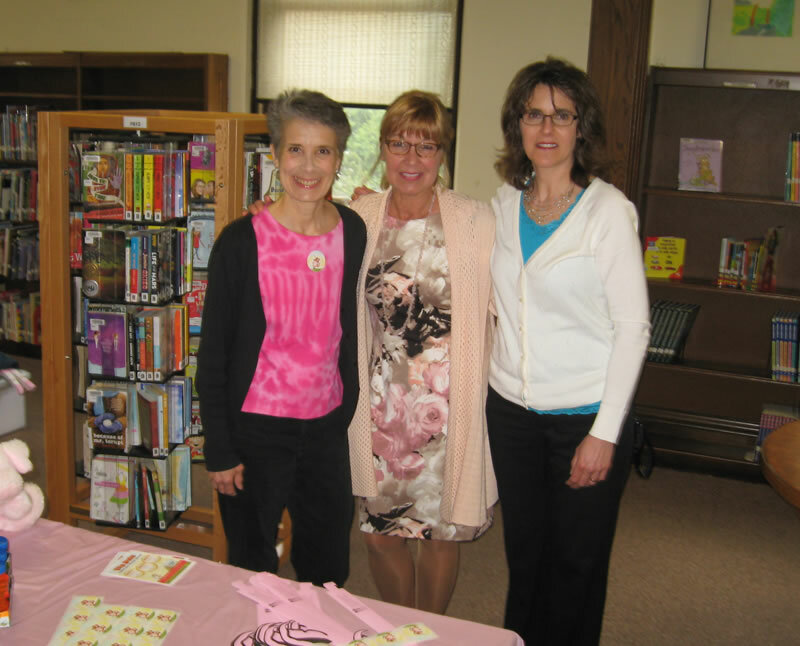 Here's the always beaming Gail Nordstrom (left) with Library Director Leslie Randall and Jeanne Frederick. Our last stop on this tour of the Viking Library System was Thorson Memorial Library in Elbow Lake. By then, Tom was getting so used to the hat, sunglasses and feather boa, I wasn't sure he was going to give them back. Honestly, we had so much fun on the road together. 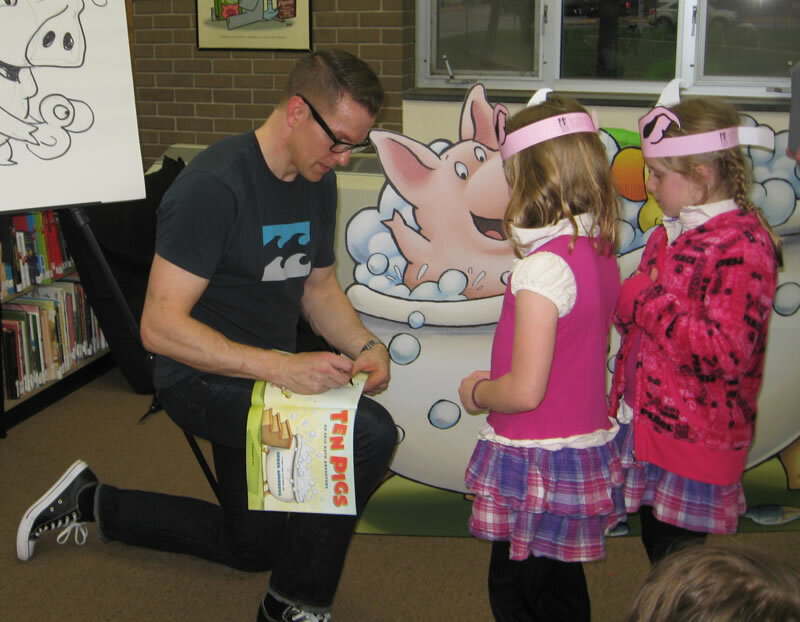 By the end of the tour, even Tom was signing copies of Ten Pigs: An Epic Bath Adventure. The not-so-weary road warriors return from a fun week of shows to be greeted by the fiercely loyal, Louie! There are so many people to thank from this leg of the tour. We're so grateful to Gail Nordstrom for her company, her hospitality (and those goody bags- thanks Gail)! Thanks to Cathy Lundquist and Terry Anderson in Wheaton, Minnesota. Thanks to Sharon Ehlers, Anne Barber and Melissa Yauk in Morris, Minnesota. Many thanks to Sarah Wethern, Jake Odland and Kristin Woizeschke in Alexandria. Thanks to Arielle Krohn and Erin Smith in Fergus Falls. Thanks to Leslie Randall for the delicious lunch in Glenwood and thanks to Jeanne Fredericks for your help with the show. And thanks to Jan Nelson, Pat Anderon and Gail Hedstrom in Elbow Lake, Minnesota. More pictures from the next leg of the tour are coming soon! 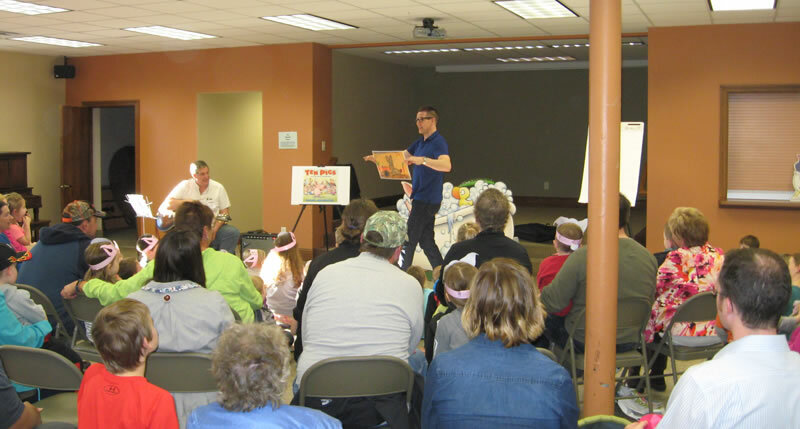 Derek presenting to an audience of more than 300 in Virginia, Minnesota in April. Upcoming Ten Pigs Trunk Shows! We're nearly half way through the Ten Pigs Trunk Shows! 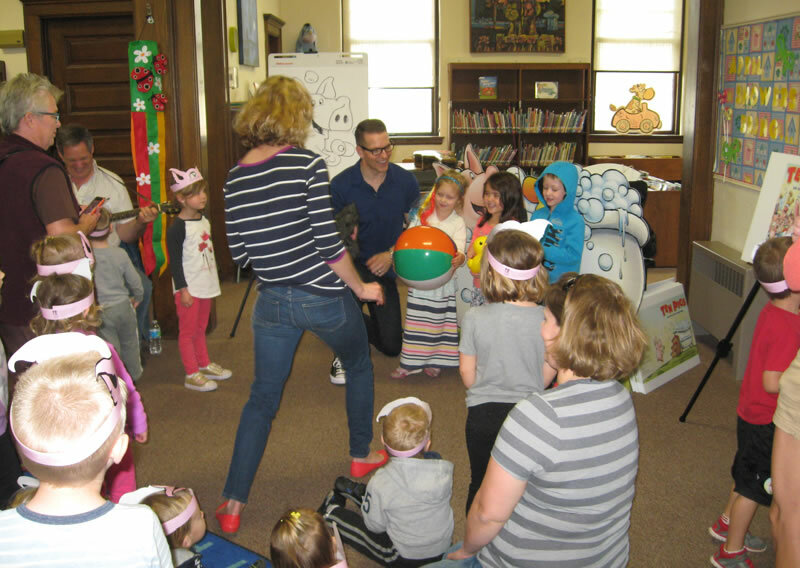 We've had such amazing audiences of young readers and their grownups and I have tons of fun pictures to post. 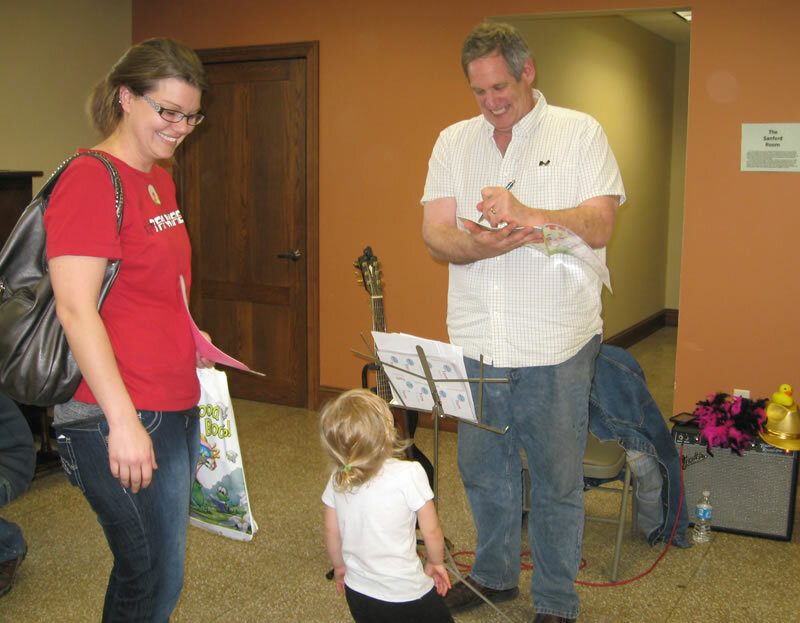 But first- there are more shows coming up over the next two weeks in southern Minnesota. 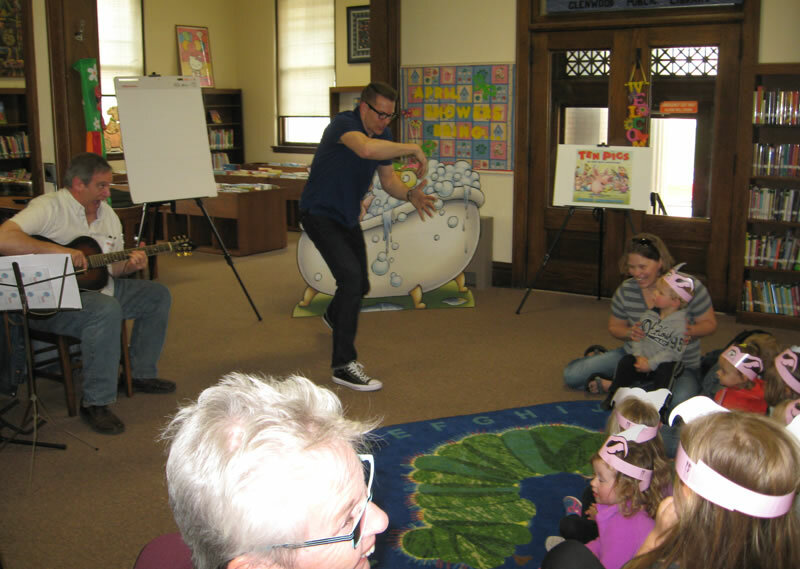 Find a library near you, stop by and say hello! Once Upon a Reader calendar page and click on the library you're interested in HERE. All shows are free and open to the public. Book covers aren't easy to make. Sure, they look easy. When we see them in bookstores or online, it's as if they've always existed. But so much thought goes into choosing and creating that perfect image. That single image on the cover tells a reader 'This is what this book is all about, this is what you can expect.' It may tease you, surprise you, or even shock you, but it should always invite you. The cover is an invitation to open the book and experience the world inside. 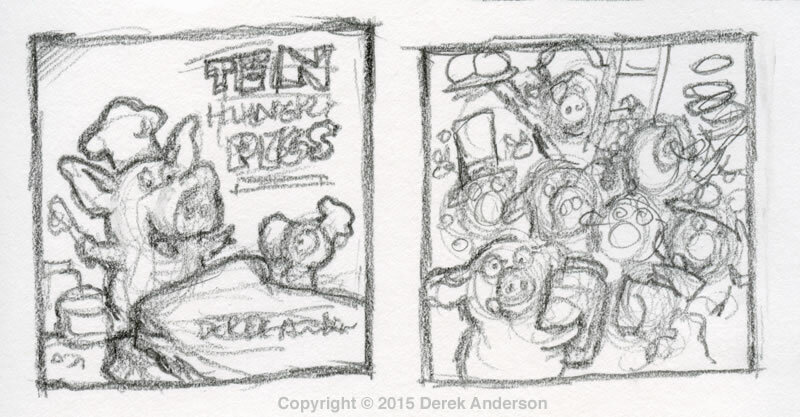 When I set out to create the cover of Ten Hungry Pigs, I had to take into consideration that it was a companion book to Ten Pigs: An Epic Bath Adventure, so the covers needed to have a similar flavor and feel, though clearly be different. 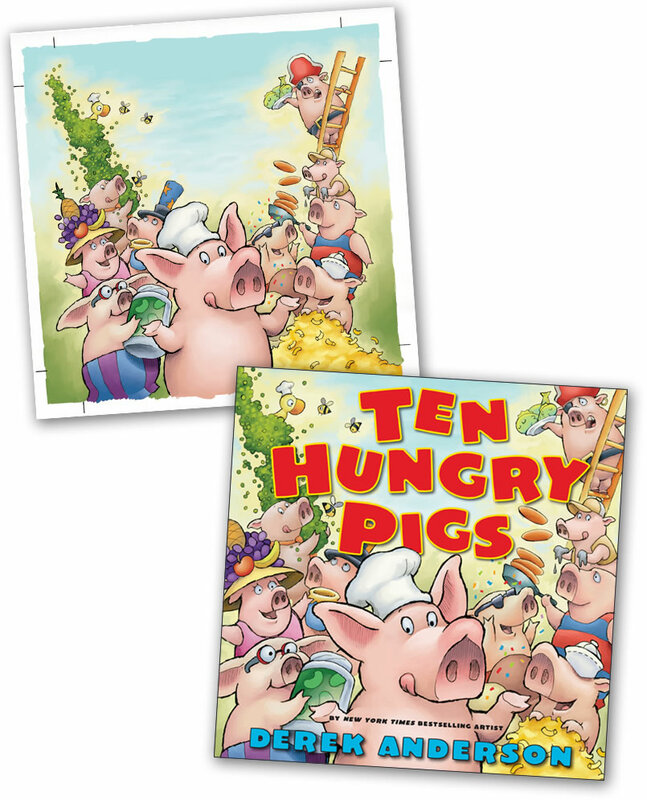 I didn't want to do the same thing with the cover for Ten Hungry Pigs. 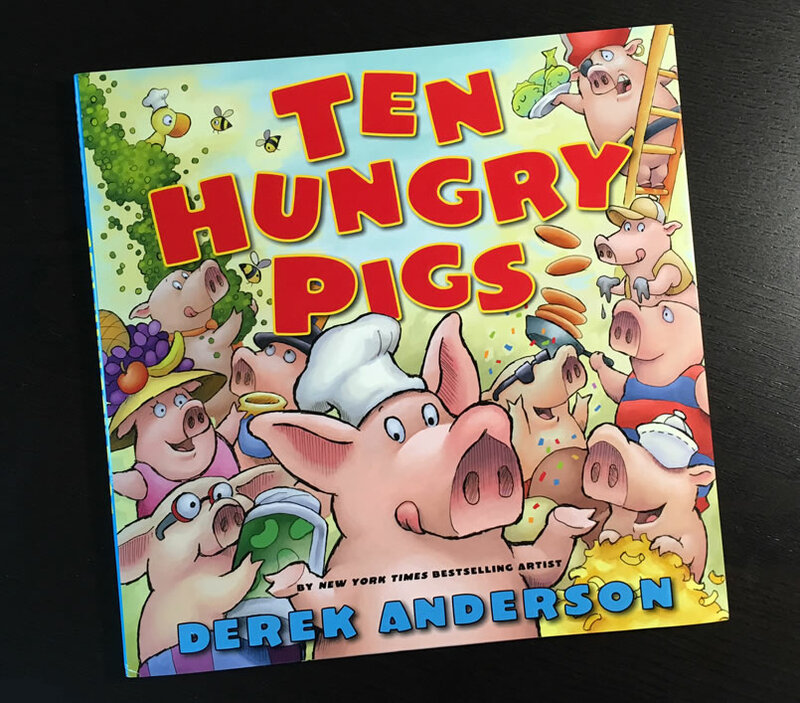 In this book, our Pig Hero and his Ducky friend are making a peanut butter and jelly snack and the other pigs come along, adding their own favorite foods (which I assure you- do not go with peanut butter and jelly). 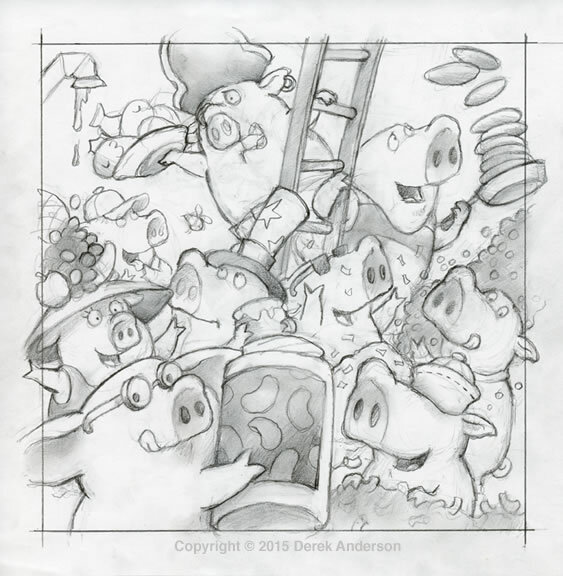 So the rough I did was very simple- I kept our Pig and Ducky characters center stage and decided the other pigs could crowd onto the back cover with all their favorite foods. Both Ken and David loved the energy of this sketch and wanted to use something like this on the front cover. This wasn't an easy challenge. There's no focal point in this sketch. There isn't a single part that draws your eye in and says, 'Look at me!' I liked the idea of not necessarily having a focal point on the back cover, so your eye just keeps going around and around at these crazy pigs and their foods. But it's too confusing to do that on the front cover. I have to show the reader what I want them to look at. It took some work, but this is what I came up with. I was able to include all the pigs on the cover with their foods by creating a "V" shaped composition. I placed our main character at the front and center and the other pigs behind him, stacked on either side and receding into the background. 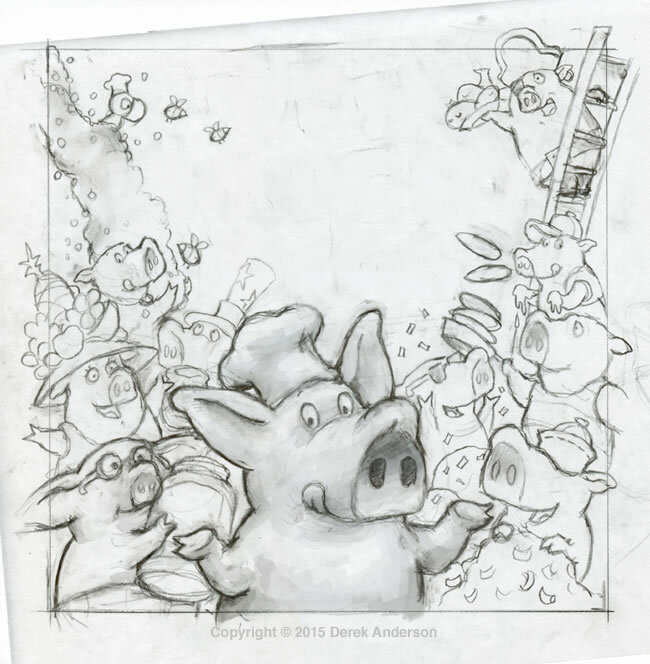 It contains all the energy the last sketch had, but the V acts as an arrow, pulling your eye down and forward where our Pig is inviting you to come in and enjoy the book. I had to be sure and leave enough room for the title and byline. When creating final artwork for a cover, we always have to include extra "bleed" around the edges. Bleed means I'm creating extra parts of the picture that won't show. They go off the edges of the page to safeguard against white paper showing up around the edges of the book. You can see my crop marks on the left image below- those are to show the art director where the edges of the cover will fall. And below right you can see the finished cover after David Saylor has done his magic with the type treatments and layout. 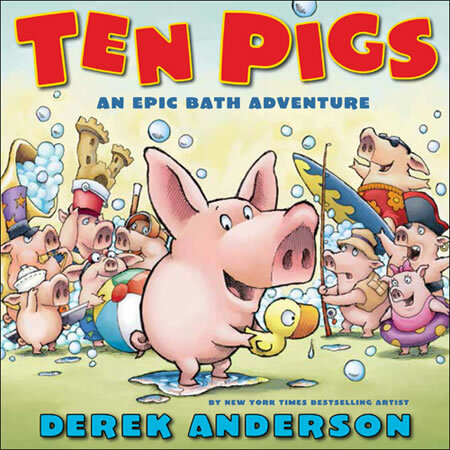 Not only does this cover capture the energy and chaos that happens in the book, it's also a nice compliment to the cover of Ten Pigs: An Epic Bath Adventure. A lot of work goes into making a book. Every detail has to be considered- from the front cover, story and interior illustrations to the endpapers, jacket flaps and back cover so my readers will have a fun experience every time they read one of my books. And I wouldn't be able to do any of this without my amazing team at Scholastic.